Natural communities are named after plants, but animals play a crucial role in maintaining the health of natural communities. Plants and animals need each other in order to survive and thrive. Leaves and tender twigs are a major component of the diet of many insects, as well as larger animals such as deer and rabbits. Seeds are an important food source for many animals. Wildlife managers call edible seeds “mast.” Seeds encased in a dry, hard shell—such as acorns—are hard mast . Seeds surrounded by pulpy flesh and thin skin—such as berries—are soft mast . High-fat berries of northern spicebush (Lindera benzoin) are good fuel for birds migrating south in autumn. Photographer: Gary FlemingBerries and other soft mast don’t last long and are eaten by wildlife as they ripen. Soft mast is a good source of vitamins, carbohydrates, and moisture. Producers of soft mast include flowering dogwood (a favorite of many birds and mammals), blackgum, blueberry, huckleberry, serviceberry, cherry, wild grape, poison-ivy, and viburnum. The hard covering of hard mast such as acorns and beechnuts protects the seed from drying out and allows it to last for a long time without decomposing, making it an important winter food. Acorns, a high-energy food source, are the most important wildlife food in the deciduous forests of North America.1 White-tailed deer, white-footed mice, squirrels, eastern chipmunks, raccoons, red foxes, woodpeckers, blue jays, crows, white-breasted nuthatches, wood ducks, and mallards all eat acorns. 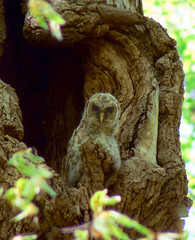 A juvenile barred owl sits by the nesting cavity its parents selected in an old hollowed out tuliptree. Photographer: Julie McCallPlants also provide wildlife with shelter, nesting sites, and protection from predators. Squirrels and some birds of prey build nests in forks of tall trees. Other birds build nests in bushes and small trees. In trees where cavities don’t naturally exist, some animals—primarily woodpeckers—are able to excavate cavities in which to nest. Secondary cavity nesters, such as wrens and tufted titmice, take advantage of existing cavities, whether naturally present or excavated by primary cavity nesters. Deciduous trees overhanging streams and ponds keep water temperatures cool in summer for fish and other water-dwellers, and also supply organic material ( detritus ) to the water. This provides food for invertebrate animals such as aquatic insects—important not only to fish but the entire food chain . Dead standing trees and fallen trees on the forest floor serve as nesting, observing, and resting sites for reptiles, amphibians, small mammals and birds. Dead trees also attract insects, mosses, lichen, and fungi, which in turn feed many birds and other wildlife. Animals help plants reproduce by carrying pollen from plant-to-plant and by spreading seeds. Animals that eat insects and small mammals help reduce damage by caterpillars, rabbits, and other plant-eaters. Hummingbirds, bees, butterflies, other insects, and even bats pollinate the flowers of plants. Pollination brings together pollen from male and female plants, which allows plants to produce seeds. Many bird species feast on caterpillars, which are leaf-eating machines. Eastern tent caterpillars, for instance, build silky tent nests in crotches of trees such as black cherry in the spring. These caterpillar colonies can strip a tree of all of its leaves. However, birds such as Carolina chickadees and the migratory black-throated green warblers tear open the tents in early spring, eating dozens of the young, small larvae, sometimes before they have done much leaf damage. Later in the spring, yellow-billed cuckoos arrive from the south; a single individual can make a meal out of whole colonies of mature, two-inch hairy caterpillars. In fact, eastern tent caterpillars are a necessary mainstay of this cuckoo’s diet. Interested in seeing some of the natural communities where animals hang out? Go to Parks & Places, and pick a park to explore! 1. McShea WJ, Healy WM. 2002. Oaks and acorns as a foundation for ecosystem management. Pages 1-9 in Oak forest ecosystems: ecology and management for wildlife (W.J. McShea and W.M. Healy, editors). 2. Perkey A, Wilkins B, Smith HC. 1993. Managing wildlife crop trees. Crop tree management in eastern hardwoods. 3. Fergus C, Hansen A. 2005. Trees of New England: a Natural History, page 67. 4. Hammerson GA. 2004. Connecticut Wildlife: Biodiversity, Natural History and Conservation. 6. Anderson R. 2009. Personal Communication, 4/18/2009. Sierra Club outing guide, and D.C. birder. 7. Thompson B. 2009. Bill of the Birds: It’s Getting Cuckoo. 9. USDA NRCS, Wildlife Habitat Council. 1999. Ruby-throated Hummingbird (Archilochus colubris).